A commercial finance company is expanding again after 55 years’ worth of banking experience joined its growing team. Commercial Expert, based on Aycliffe Business Park in Newton Aycliffe, has recently taken on new business manager Rod Dales and office administrator Susan Driver. Rod, from Redcar, worked for the Royal Bank of Scotland for 35 years before joining the Aycliffe company, and has spent the last two decades as business relationship manager for the bank. Susan, from Bishop Auckland, worked for Yorkshire Building Society for 20 years before relocating from Bradford to the North-East. 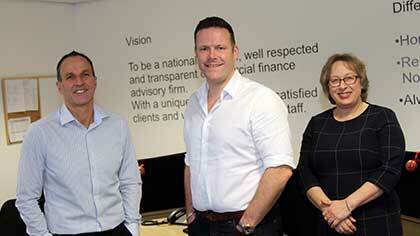 Commercial Expert’s managing director Mike Coates, pictured with Susan and Rod, says the double appointment is another sign of the firm’s rapid progress. “We’re very excited about these developments and which direction the business is heading in,” said Mike, who formed the company in 2008. “First and foremost both appointments are to relieve our work-load due to the volume of business and enquiries that are coming through the door – we literally just needed more people to cope with that. While also helping to cope with work-load, the new appointments at Commercial Expert are also designed to explore new markets. Mike added: “Rod brings with him a wealth of experience, as well as contacts, but he also brings a lot of expertise in trading businesses. “We’re experts in property finance, but we’re now in a position to start expanding our portfolio of trading businesses as well, which is Rod’s background. “We can cater for all areas of business finance, so with Rod we’re hoping to expand that side of our business, and we’re very pleased to have him in the team. After 10 years with RBS, Rod progressed to a business relationship role, looking after a portfolio of companies across the Tees Valley area from shops and pubs to accountants, solicitors and large industrial firms. He said: “I have a network of contacts across Darlington and Teesside that I’ve built up over the last 20 years, but I also bring some expertise in trading businesses. Susan worked in YBS branches for 10 years before spending another 10 years in an administrative role at the bank’s head office in Bradford. She said: “We’re in a very progressive industry but Commercial Expert is a forward-thinking company and has already evolved a great deal in recent years. Mike formed Commercial Expert in 2008 after he diversified from residential mortgage and insurance advice. Originally based in Darlington, the company relocated to Newton Aycliffe in 2012 to facilitate growth before expanding to larger offices again a year ago, taking on two new employees. In April this year the company was announced as the first official intermediary for the Business Banking team at the UK’s only digital bank, Atom Bank, based in Durham. Commercial Expert now manages more than £48m-worth of deals a year for clients nationwide and offers a comprehensive range of business finance to a broad spectrum of clients covering all areas of business finance.